Anyone who has reveled with us knows that we are all about circles here at Washington Revels. The members of Jubilee Voices, one of our year-round performing ensembles, hold hands in a circle to share a moment of peace and togetherness before a performance. We sing a goodnight song in three concentric circles at the end of many Community Sings. 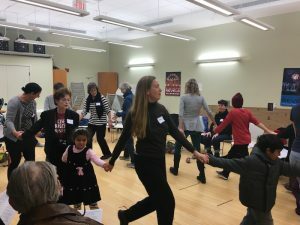 The very idea of circling is foundational to Revels—since the first Christmas Revels in 1983, every rehearsal and performance has begun with a circle. In more recent years, the cast has even been organized into many different overlapping circles: Stage Families, Children’s Chorus, Teen Chorus, Adult Chorus and the full ensemble. At the end of every show, our backstage and front-of-house volunteers join the performers on stage for a final bow, after which we all sing the “Sussex Mummer’s Carol” hand-in-hand, circling as we sing until we wrap around the audience at Lisner Auditorium, encircling them all. 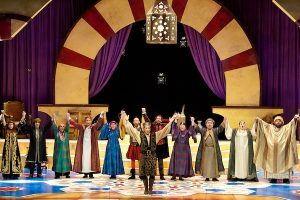 Revels often describes this combination of cast, crew and audience—which makes our magical celebration of music, dance and drama possible—as the largest circle of The Christmas Revels. And, with an outreach show and eight public performances reaching over 10,000 people per year, that’s a darn big circle! But how about the rest of the year? Where are our circles, and how do we grow them to be even more inclusive? All year round, we look inside and outside of our community and ask how Washington Revels can best nourish our neighbors’ need for joy, for meaning, for togetherness. How can we bring more people into the circle to celebrate and build community with us? As Marketing & Programs Director, answering this question is one of my most important tasks. With co-workers and volunteers, I chat with audiences, longtime Revelers, new arrivals and community members to discover what programs they think would make a positive difference in their lives. We tweak our longtime offerings—trying our monthly Community Sings in a new location, or offering additional Pub Sings, for example—and we experiment enthusiastically with new ideas. 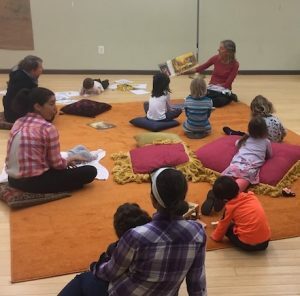 With you and your friends and family in mind, we’ve launched a World Story Time program that serves parents with younger children (a Book Club for older kids is in the works, too). We’ve connected the youngest members of our community with residents of local senior communities, singing for and with an audience that delights in our music and our company. The newest program we are considering—Revels Day of Service—would bring Revelers together to spread our Revels joy and compassion through service projects that reach beyond our community and that include caring for our natural world and for the people in it. Of course, we’re always searching for ways to connect these programs to the people who can most benefit from them. If this includes you, then I hope that we’ll see you at one of our upcoming events—and if you think your neighbors need some Reveling, please let them know, or bring them along with you. And please let us know how we’re doing, so that we can craft a strong and welcoming community for years to come. You can always reach me at jrasi@revelsdc.org.